They are made with 2 mil thick plastic sheet that means applicable for most purposes. 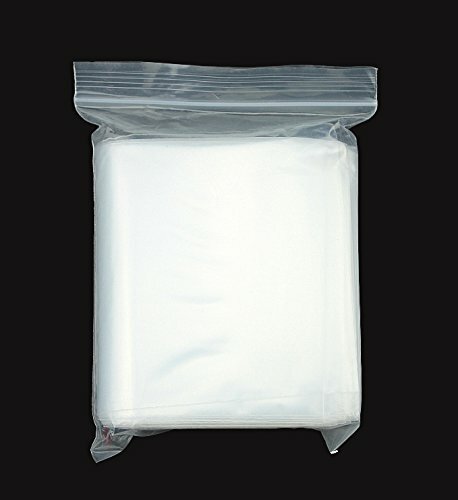 The bags are made with polyethylene(PE). These bags are completely ecofriendly, harmless and no smell. All virgin polyethylene film meets FDA and USDA requirements. The zipper seals great and easy. They are waterproof and dustproof, so they are perfect for storing delicate things to prevent them from getting damaged by water or dust. It has a clear look with everything inside. Different size meets different purposes. These bags are use for holding books, clothes, documents, photographs and so on. Great ideal for protection, storage, organize and shipping. Search "Halulu" to get more choices. Each pack contains 100 Bags which will last you a long time. It's reasonable for the price. If there's a problem i.e. damaged/missing item rec'd, please don't hesitate to write back to us !